The 34th season of Survivor has put together a group of legends and randoms for the moves they made to "change the game". I mean, technically every person could qualify since every vote changes the game, which would the explain some on the people cast. But this is only the beginning of the "Game Changer" puns, so buckle up. Probst does a little question and answer session with the group before kicking off the classic marooning to grab supplies and GTFO. In the midst of chaos, Andrea unearths a Secret Advantage envelope... and totally misses it. Sierra Dawn Thomas snatches it right up. Ozzy the human/dolphin hybrid is first in the water to snag up a toolkit, and after ransacking the boat, everyone else joins in the water to paddle to their new homes and the cutthroat game ahead. Nuku bonds right away and admires their campsite overridden by goats. Sierra sneaks off to read her envelope, which is an updated Legacy Advantage; it guarantees her immunity if she plays it when there are 13 people left in the game, or 6, and must be willed to another if she's eliminated. 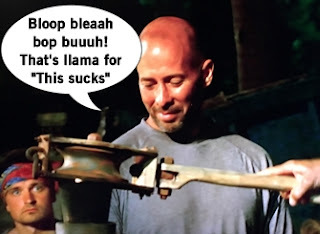 Game Changers is a whole new season, but the history between Cirie, Ozzy, and JT are tales we still tell our grandkids about. While Ozzy and Cirie talk and there's an impression of peace, a truly cringeworthy chat with Tai and his inability to lie shows that Cirie might still be in trouble. Over on Mana, the big names are the targets with Tony initially the biggest. He pretends to run off to find an idol, then continues to re-use his famous bag of tricks by resurrecting the spy shack as a "spy bunker," a hole by treemail. Too bad this secret hideaway is discovered immediately by Troyzan and now Tony is on the radar. Big names, big targets. The tribes assemble for their first Immunity Challenge, where Jeff unveils the sea diving helmet idol. If the Sprint Player of the Season award returns, I'll give my vote to whichever castaways tries to fit that helmet over their head. 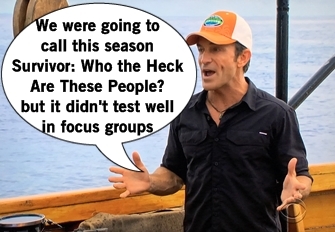 Probst has an even bigger reveal than Steve Zissou's helmet: in the event of a tie at Tribal Council, the re-vote is gone and it immediately goes into a group discussion, and then rocks if a unanimous agreement isn't made to eliminate someone. Talk about a game changer! Get it? OK, the first immunity challenge is to complete an ocean obstacle course, find puzzle pieces in the sand (to mentally screw with the Kaoh Rong folks), and end by assembling a ship's wheel puzzle. 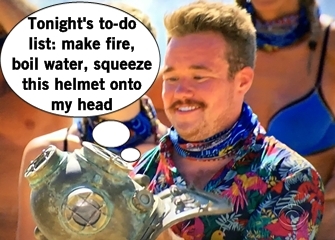 Nuku wins the immunity challenge and gets to bring home the sea diving helmet idol and wins flint. Mana returns to camp defeated, but as veterans of the game they're all ready to begin scheming. 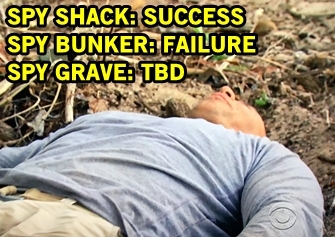 Tony is top-of-mind because he's sneaky, but the tribe needs to remain strong in challenges. Ciera was quick to drop Tony and Caleb's names as targets, indicating that she's playing the game hard already. The majority agrees that Ciera should go home because she's physically the weakest and a slick player who will do whatever it takes. In order to make the plan seem real, the group tells Ciera they are voting out Michaela, and surprise: Michaela isn't happy and can't hide her emotions. But is this emotional reaction enough of a game changers to switch the plan? Again, see what I did there? Tribal Council time! This season's set is an amazing lighthouse and shipwrecked boat, which reminds me of Survivor: Palau's military theme. When Hali says "loose lips sink ships" I feel like every producer cackled with joy to hear that phrase spoken in front of their finely crafted dilapidated boat. The tribe discusses being dubbed "game changers" and how past impressions impact the current game. Probst mentions that Sandra would be the easy vote because she's already won twice, but Sandra argues no one would give her that win a third time (wrong). Michaela answers that she expects that she'll see at least for herself tonight, which is a subtle burn of majority control. Sandra subs chapter one of Survivor: Game Changers "The Unknown" and then the tribe votes. 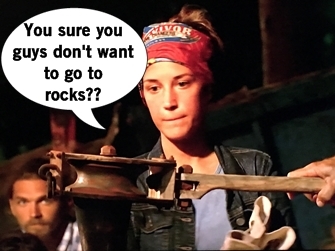 As discussed and to her surprise, Ciera is eliminated in a 9-1 vote. Onto hour 2 of the premiere! After an easy consensus of a first vote, the real game begins and Tony starts to assemble his alliance of fellow threats: Aubry, Caleb, Malcolm, and Sandra. It's all great until Tony overhears a late night conversation between Sandra and Troyzan that mentions his name. The niceties are over and it's a war of the winners, with Tony and Sandra each trying to acquire an army to take out the other. Over on Nuku beach, Cirie is still worried about the looming danger of Ozzy/JT so she tries to make deals with Debbie (who keeps pronouncing her name as She-ree), Zeke, and Sarah the cop (who accepts for now but admits she'll play like a criminal this season). While someone like Sarah is open to change, Tai is the same ol' Tai, putting the chickens on leashes and making them pets. Don't get me started. The second Immunity Challenge has the survivors untying and carrying a giant snake from the ocean, solving a puzzle, and wrapping up with the most pressure-filled game of ring toss. While everyone was distracted by double entendre snake jokes, I'm impressed at this interesting new challenge and how cool this big, 400lb anaconda looking thing is. 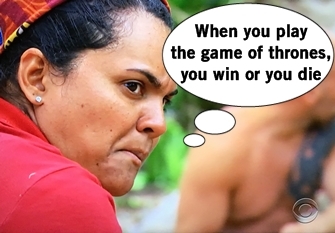 In a ring toss showdown, it gets oh-so-close but JT narrowly defeats Malcolm, securing immunity and fishing gear for Nuku and sending Mana back to Tribal Council. Given their terribleness at challenges, Tony's side tries to flip Michaela, a challenge beast, to their side to keep Mana strong. Sandra's side plans to target Tony, but since he might find an idol they're going to risk splitting the vote on Tony and Aubry. This is a Game of Thrones level battle for the Mana kingdom and someone's going down. Tribal Council time! There's discussion about needing to keep strong physical players around. Troyzan thinks the vote will make the tribe 50% less paranoid, an obvious tip of the hat to Tony, which Sandra hops onto and agrees with. Then a bug attacks her because I'm guessing the bug is totally on Team TV. Varner says they're a round hole getting rid of a square peg, which confuses Tony and gives Sandra another chance for a dig at Tony. Sandra casts a vote against Aubry as a precautionary idol move, but it's Tony who is eliminated. The battle is over and Sandra gets one last tiff in as Tony's torch is snuffed.